GIGLIO ISLAND, Italy — My ferry was full of school groups, delivery trucks and tourists when we left the Tuscan port of Santo Stefano and headed toward the island of Giglio, 12 miles away. I sat on deck with the other foreigners, enjoying the spring sunshine: It was too cold for the Italians, who huddled downstairs drinking espressos. And then, Giglio’s white cliffs appeared in the distance and gradually grew closer. Except that there are no white cliffs on this granite island. 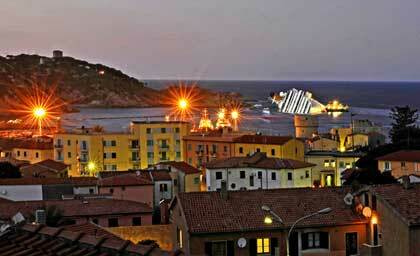 I was looking at the wreck of the Costa Concordia, which ran aground Jan. 13 just outside Giglio’s harbor. As the ferry whipped past, my eyes were drawn to the great wreck, which lay on its side with a long, rusty gash in its hull. It name was inscribed on a white bow towering above the water. The ship was so close to the tiny harbor, massive and modern and incongruous. Giglio is known around the world because of the Concordia, but I was hoping to see a Giglio that was not defined by the disaster in which 32 passengers and crew died. Thirty-five years ago, my husband, Mike, lived on Giglio for several months, shortly after its inhabitants gave up mining granite and pyrite and abandoned self-sufficient agriculture in favor of tourism. He remembers an unspoiled family vacation island, little known outside Italy, where affluent Romans (plus a handful of foreigners such as Los Angeles political power broker Stanley Sheinbaum) spent their summers in apartments or second homes.